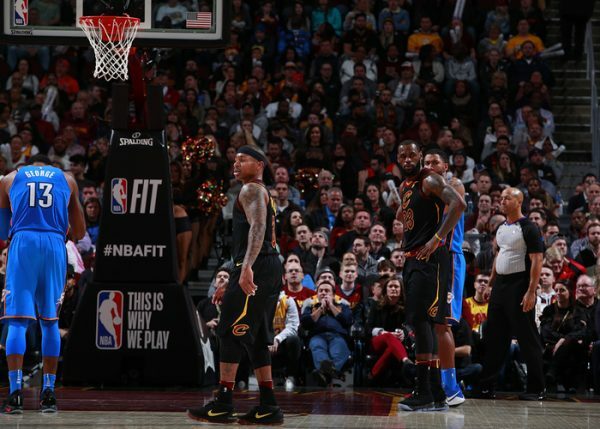 (Cleveland, OH) — Slow starts in each half and virtually no defense throughout the game sent the Cleveland Cavaliers to an embarrassing 148-124 defeat at the hands of the Oklahoma City Thunder at Quicken Loans Arena on Saturday afternoon. The loss marked the Cavs’ fifth in their last six games and ninth in their last 12 matchups. Oklahoma City finished the game shooting 58 percent from the field and held a commanding 52-28 advantage on the boards, taking control of the game early. Each comeback effort by the Cavaliers was repelled by the Thunder, who led by as many as 31 points in the game. The points scored by Oklahoma City were not only the most allowed by Cleveland this year, surpassing the 127 allowed at Orlando on Jan. 6, but also matched the most allowed in a regulation game in team history. LeBron James, who stood just 25 points away from reaching 30,000 in his career, managed to tally just 18 for the game. That means that he’ll presumably reach the milestone away from home on Tuesday night, with the veteran also adding seven assists and three rebounds. Isaiah Thomas led the Cavs with 24 points and four assists, with Jae Crowder the only other starter to score in double figures with 17. Others reaching double-digits in scoring for the Cavaliers included a trio of bench players: Jeff Green and Derrick Rose with 12 and Dwyane Wade with 11. The first few minutes of the contest set the tone for much of the game, with the Thunder scoring the first eight points. At one point, they shot 77 percent from the field in that opening period and led by as many as 20 points, while dominating the glass with a 16-5 edge. “On that end, we don’t trust each other and that has to change,” Thomas said of the team’s defensive effort. Meanwhile, the Cavs’ shooting woes saw them struggle to put the ball in the basket, finishing the opening quarter by hitting just 39 percent of their field-goal attempts, compared to the Thunder’s 63 percent from the field. The latter number helped give Oklahoma City a 43-24 advantage when the horn sounded. The Cavaliers managed to score the first 10 points of the second quarter and would reduce their deficit to as little as eight points at 50-42, thanks to an 18-7 run. However, Oklahoma City still controlled the boards, including a 10-2 edge in offensive rebounds, which allowed it to continually build the lead back up after surges by the Cavs. At the half, the Cavaliers faced a 76-60 deficit. Part of the reason for the rebounding disparity during the game stemmed from the absence of starter Kevin Love, who played just three minutes before leaving, reportedly due to illness. On the defensive front, the Cavaliers seemingly had no answer for the Thunder’s Paul George, who managed to score 25 points in the half, finishing with 36 on the day. Meanwhile, George’s teammate, Russell Westbrook, collected a double-double with 23 points and 20 assists. The Cavaliers’ struggles don’t get any easier with their next contest being a Tuesday night road matchup against the San Antonio Spurs. That game will tip off just after 8 p.m. ET.